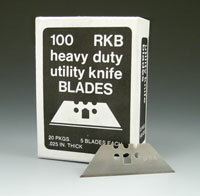 Blade locks at several cutting depths and retracts when not in use. Solid metal handle stores extra reversible blades. Includes five blades. Replacement blades (Item Number 10-86-01) sold separately.